Thank you to the Hoover and Spain Park fans for making our 3rd Annual Hunger Challenge our BIGGEST success yet! The Spain Park Jags jumped to a quick lead on the donation board for the “Compassion Competition.” Jags held the lead the entire game in the Hunger Challenge until late in the game. The last few minutes of the game, Bucs scored BIG in the end zone and in the Hunger Challenge. 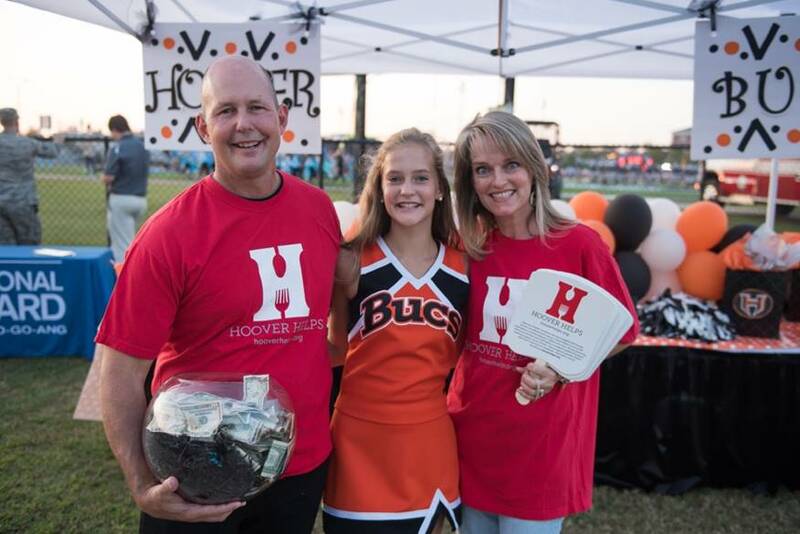 A last minute online donor put the Hoover Bucs over the top to finish with a spectacular amount of $6,462 vs. Spain Park’s amazing finish of $4111.00 for a record total of $10,573! The city of Hoover is blessed with the best fans ever! The night was truly inspirational as the numerous volunteers helped to make the Hunger Challenge so successful. The Berry and Bumpus cheerleaders distributed fans to help keep the fans cool and promote the “Compassion Competition”. Thank you to the Hoover area McDonald’s owners for donating these fans for this event and support provided to our community. In the end, the big winners are the citizens of Hoover who helped those that are in need. We all helped by giving a donation, giving of your time or giving a shout out on social media. Thank you all for your help as all of the proceeds will go directly back into programs that support children in Hoover. Your support is greatly appreciated and will make a huge difference. Go Bucs and Go Jags! Thanks to the City of Hoover!